The United States of America is a vast and diverse business landscape: 50 states (and 5 permanently-incorporated territories) participate in a federal legislative infrastructure, but also represent their own administrative regions, with state-level rules and regulations complicating the important issue of payroll compliance for millions of businesses within the nation’s borders. The complexity of payroll in the US reflects its political and societal development. After the Declaration of Independence in 1776, 13 original states agreed to enter the historic political union, while the subsequent 37 joined over the next 200 years - with Hawaii the last to be incorporated in 1959. Since each state has its own legislative powers, and is characterised by distinct political, cultural, and economic concerns, it’s easy to see how the landscape of the United States has diversified significantly over time - along with the laws governing payroll. A portal to Canada, Mexico, the Central and South Americas, Europe, and Asia, the USA’s status as a high profile international gateway is also a complicating factor for payroll - and compliance is a particularly crucial concern for businesses with a global footprint. Foreign business interests which set up in the United States must get to grips with the nuances of local, state, and federal tax legislation, and with the various laws which apply to global employee populations working within the country. To this end, many businesses within the US must develop a global payroll solution which both suits their needs, and integrates these obligations with international concerns. This task may, of course, be outsourced to a payroll service provider, in order to import compliance expertise, and a degree of administrative efficiency. Global payroll: A global team working to provide payroll processing and address employee queries in personal detail. Global mobility: A team working closely with the expat workforce to maximise the financial and efficiency benefits of mobility. Payroll software & technology: Implementation of a range of software platforms to replace inefficient manual procedures. Our solution consolidated and aligned the drilling company’s payroll processes inside and outside the US, improving reporting, procedural efficiency, and employee support. Whether engaging global payroll services or not, achieving high performance processing not only helps US businesses navigate the state and federal legislative landscape, but delivers benefits and efficiencies for their employees. From language and currency, to tax rates and Medicare, a foundational understanding of US payroll basics is vital to building your business’ pay system. Basics: United States’ employees are paid in US dollars ($), and while the country has no official language, business is predominantly conducted in English (32 states have granted English official status). Businesses must register for payroll in the state of their formation, and obtain an Employer Identification Number (EIN). Pay frequency: There is no federal law in the US regarding the frequency with which employees must be paid. In practice, many individual states have their own legislation for this aspect of payroll, but businesses may have to choose an appropriate schedule themselves. Income tax: At a federal level, employers in the US are required to withhold income tax, at source, from their employees - and report those taxes to the IRS. Most states and some localities also levy income taxes, and impose withholding obligations on employers. Federal income tax rates in the US are progressive, and are charged at rates ranging from 10%-37%. 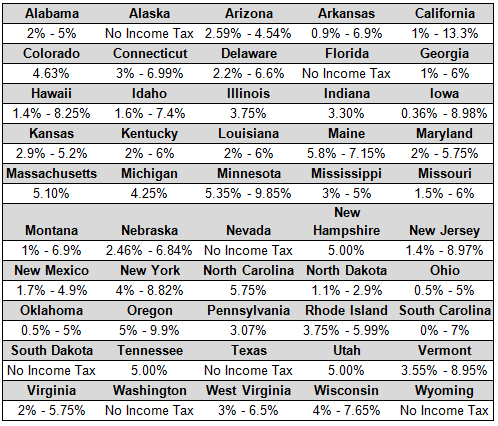 Just as with the federal income tax system, most states use a progressive tax system, though some have a flat tax rate and others actually have no income tax at all. Although not a state, the District of Columbia charges income tax rates of between 4%-8.95%. Many local jurisdictions such as cities or towns, especially in the states of Pennsylvania, Ohio, Kentucky and Indiana, also apply income and occupational taxes. Social security & Medicare: Under the Federal Insurance Contributions Act (FICA), employees and employers must contribute to the United States’ social security and Medicare schemes. Like income tax, these contributions are withheld at source by employers. Although subject to change on an annual basis, 2018 social security rates were set at 6.2%, and Medicare rates at 1.45%, for both employers and employees. Federal Unemployment Tax Act (FUTA): Employers are required to pay unemployment taxes to states and the federal government in order to finance unemployment insurance program trust funds. Authorities: The primary tax authority in the United States is the Internal Revenue Service (IRS), which is responsible for collecting and administering income and social taxes at the federal level. Tax compliance is a significant focus of the IRS, so employers should make their understanding of reporting and remittance under the IRS tax code a priority. While federal unemployment tax is collected by the Internal Revenue Service, the U.S. Department of Labor actually oversees the federal unemployment insurance program, coordinating administration with the states. Businesses must get to grips with an extensive system of labour laws in the United States - many of which have consequences for payroll. The major labour legislation in the United States is the Fair Labor Standards Act (FLSA), which focuses on overtime regulations, minimum wage, and other work-related requirements that employers must uphold. The FLSA does not mandate paid leave for employees, but an associated law, the Family Medical Leave Act) mandates up to 12 weeks unpaid leave per year for certain qualified medical conditions affecting employees and their defined family members. Under their own version of family leave, some states and localities mandate more time off, or paid sick leave. Like all territories the United States has several unique holidays, which must be factored into the pay process each year. The U.S. has 10 national holidays, but there are no federal or state requirements to actually pay workers who do not work on those days. States or territories can add to these holidays or substitute others in their place. Some states require special additional pay for employees who are required to work on a holiday. Special national holidays in the US include, Memorial Day, Independence Day, Labor Day, Veterans Day, Thanksgiving, and Martin Luther King Day. The US tax system has a reputation for complexity, and in 2017 the Global Payroll Complexity Index (GPCI) rated the country 5.78 out of 10 - a point lower than 2016 thanks to an increased outsourcing trend to domestic and global payroll providers. In addition to tax withholding obligations, employer responsibilities include filing payroll forms and other reporting documents with the IRS (such as Form 941 quarterly, and Form W-3 annually), and providing employees with their annual tax statement (Form W-2). The United States’ payroll challenges should, of course, be addressed and overcome through suitable education and training - which may be sourced from a variety of institutions, including the American Payroll Association. The United States is one of the world’s largest payroll territories, by population and geographic size, spanning 9 time-zones and numerous overseas territories. Businesses in the US must consider these logistical, and environmental challenges in order to build a suitable payroll system. To get an idea of the scope of this challenge, explore our work with a US-based application security company. In this case, global expansion had led to payroll problems - in particular, limited visibility of reporting and costs over the locations involved. Our solution addressed these issues by reducing manual processes, and improving reporting and cost control across the business’ territorial footprint. Beyond Medicare (which covers people aged over 65, and the disabled), health coverage is the US is provided by private insurers - with many employers offering employees an option to join their business’ scheme. Employers with over 50 employees are required to offer their employees a healthcare plan that meets minimum defined coverages. Healthcare insurance contributions and their respective tax treatment remain a significant complicating factor for payroll departments, which must accommodate the calculations of various employee plans. While much of this process can be automated using payroll software, larger companies (over 1,000 employees) may require up to 20 interfaces to manage healthcare administration. In fact, the larger the employee population, the more challenging its health plan administration which, in some cases, constitutes up to 80% of budgeted payroll effort. Although theoretically designed to work in synchrony, in practice, there is often friction between the United States’ federal and state laws. Payroll departments must scrutinise both closely - since both mandate income tax and social security withholding. While federal laws may be broader in scope, state and local laws may be more rigorous than their counterparts, and offer workers greater protection (pay frequency, for example). In the absence of federal laws, state laws represent the legal standard. Four states and one territory have separate laws for overtime pay that include daily overtime requirements: Alaska, California, Colorado, Nevada, and Puerto Rico. Five states, and Puerto Rico, have laws providing benefits for workers who are temporarily disabled by injuries or illnesses not related to their employment. These benefits are funded by employers or by employee withholding. Some states require same-day payment of wages to workers terminated from employment for cause, while other states enforce a deadline of 24 hours from the termination by which employers must calculate and pay out the employee’s final pay amount. Given the US’ unique legislative infrastructure, and the government’s focus on strictly enforcing tax laws, finding a way to navigate the regulatory complexity and achieve compliance must be a priority for businesses operating within the country. Creating a US payroll solution means carefully engaging with various layers of regulation, and a range of peripheral factors. While the sheer size and diversity of the US may make the process daunting for foreign businesses, there are plenty of options available - from using an in-house system administered by employees, to engaging a service provider to implement a global payroll solution. Whichever strategy you choose, support your decision with a strong understanding of the legislative environment, and your unique business needs within the United States and beyond.